I left the East Coast 30 years ago and, except for sporadic family visits, I’ve hardly been back since. The man can leave the East Coast but the East Coast doesn’t leave the man. One yearns for corner delis with fistfuls of amazing sandwiches, serious pizzas from pizza joints whose recipes have bridged generations. And great pretzels. Coming from Philadelphia, the memory of a really good pretzel eclipses my longing for a really good bagel. 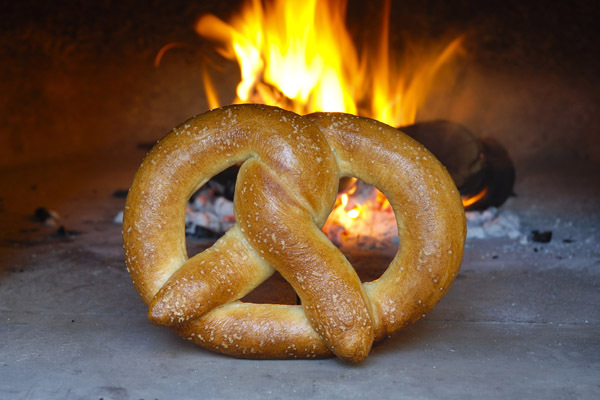 Pennsylvania, with its long German heritage, is the keeper of the flame when it comes to pretzels. 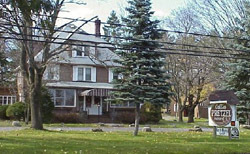 When you visit the Poconos, one of the tourist stops is the pretzel factory, not far from the Delaware Water Gap. According to Wikipedia, Pennsylvanians eat 12 times more pretzels than the national average. Really, when you put it like that, pretzels are in my blood. 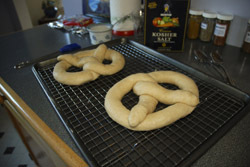 And so, I’ve been working towards a genuine soft pretzel recipe. Minus preservatives, dough conditioners, or any unnecessary fats or sweeteners. If anything, I’ve worked backwards, toward an authentic German recipe. 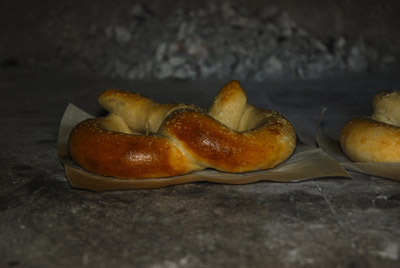 The trick, I’ve learned, is to slow fermentation at about 65º and utilize a short boiling time, so that the crust of the pretzel has a chance to form without too much heat transfer that will kill the yeast. 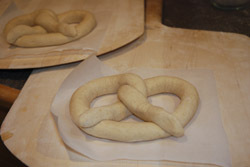 The result is a plump pretzel, crusty and smooth on the outside and dense and chewy on the inside. Perfect! So here you go: a German-style soft pretzel recipe for the 21st century, compensating for the barley malt (so hard to find these days) with new age spelt and brown sugar. Raised, boiled, and …. 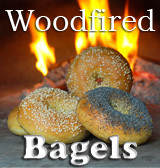 woodfired! Heat the conventional oven (alternate): Heat quarry tiles on the center rack of your oven at 400º for at least 30 minutes. For more on this, see ‘Baking bread on quarry tiles’. Cut two pieces of parchment 7” x 10” for woodfired, or to fit a sheet pan for conventional baking. Hold the ends of one dough rope and let the middle sag down to sit on the parchment two inches in from the edge. Let the rope of dough make most of a circle on the pan and then twist the ends once around to form a loose knot a few inches from the ends. Bring the tips toward you to overlap the curve of the dough, dividing the area of the circle roughly into thirds. Bake in a conventional oven: Bake in sheet pan on quarry tiles for 10 minutes at 375º, turn pan around and bake for a further 10 minutes, until the pretzels are brown and lovely. Let cool for an hour, and then devour! Congratulations! If you have made it to this point, you are in touch with your inner German roots, and have earned the right to hang a pretzel outside your door. Not only can you bake, but you rock! Oh why, oh why am I so far away from my uncle’s cooking?! This one is not too hard to read and yearn for home. I got the real pretzels in Germany! Um. I love you. All of Philadelphia now loves you. This is the best thing, ever. I definitely miss the pizza joints on the east coast! These pretzels are beautiful. Perfectly baked! Lovely, just amazing! Now I want one with some whole grain mustard spread! These look wonderful! 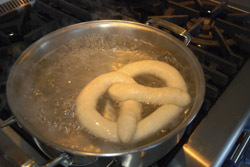 That is truly the one thing I miss from growing up in Philly…hot soft pretzels! I will have to give these a try! Yummmm…. Those look really good! Thanks for sharing the recipe. We mere mortals can only dream! On a side note – we went to a local brew pub this weekend that has a wood oven and we had….are you ready? It was popped in the wood oven and topped with crispy sage, chunks of bacon and shredded Parmesan! 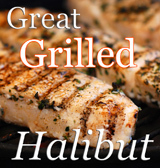 You can scoop your jaw up off the floor now and get busy trying to duplicate it in that oven of yours! Please send some my way….We love soft pretzels over here. These look divine! Those pretzels look amazing! Wish I could have one right now! I’m a native Pennsylvanian out in Illinois, and I’ve been searching all over for the pretzels that are like home- these look the best! Oh my! I can’t wait to try! These pretzels look great. I just made pretzels last week but didn’t think to cook them at the high heat like we do our pizzas. Thanks for the idea…I will be trying this again!